Ruthless Rye pours copper in color, with a two finger width white head. There is great head retention, which leaves a gorgeous, thick lacing on the glass. 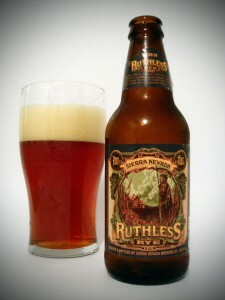 Ruthless Rye has tons of grapefruit in the aroma, with a little pine thrown in. Taking some sips, there is more grapefruit, pine, lemon, caramel, and maybe a little spice from the rye, but I may be imagining it. I would say the body on Ruthless Rye is a little heavier than medium. Carbonation seems average, and there is a resinous quality to each sip I take. Overall: A good beer, but I was surprised at how little rye there was in the aroma and flavor. I would buy it again if I wanted a good IPA, but not if I was looking for a rye beer.